Although Proverbs is not necessarily a primer on how to respond to anger, it helped me to understand the actions of my husband (who was acting foolish because his source was not the Word and he was seeking to please his flesh) and to respond in a Christlike manner. In reading through Proverbs, God softened my spirit, blessed me with wisdom and understanding, helping me to solve my day to day issues while pleasing Him...which baffled Scott. And if you ask Scott, it was that softening of my spirit, that gentleness, kindness, and quiet confidence (that could only be the fruit of the Spirit) which piqued his interest and drew him to me in the midst of the darkness and fog he was walking through. God sees you right now. He sees the things you struggle with and that you are battling. You are not hidden from His sight. Drink in Proverbs 15 deeply, embrace the truths, let them inform you in your situations that you may respond differently because you see differently. 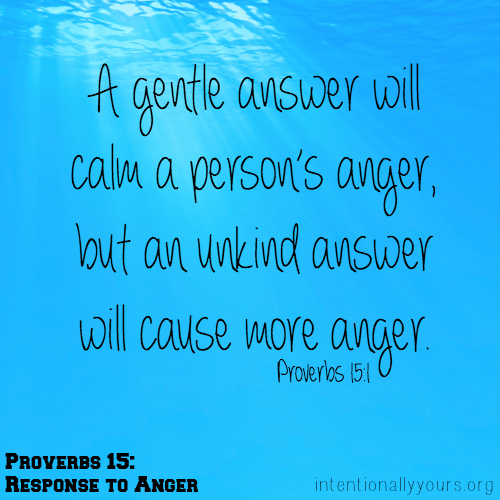 15 A gentle answer will calm a person’s anger,but an unkind answer will cause more anger. 2 Wise people use knowledge when they speak,but fools pour out foolishness. 3 The Lord’s eyes see everything;he watches both evil and good people. 4 As a tree gives fruit, healing words give life,but dishonest words crush the spirit. 5 Fools reject their parents’ correction,but anyone who accepts correction is wise. 6 Much wealth is in the houses of good people,but evil people get nothing but trouble. 7 Wise people use their words to spread knowledge,but there is no knowledge in the thoughts of fools. 8 The Lord hates the sacrifice that the wicked offer,but he likes the prayers of honest people. 9 The Lord hates what evil people do,but he loves those who do what is right. 10 The person who quits doing what is right will be punished,and the one who hates to be corrected will die. 11 The Lord knows what is happening in the world of the dead,so he surely knows the thoughts of the living. 12 Those who make fun of wisdom don’t like to be corrected;they will not ask the wise for advice. 13 Happiness makes a person smile,but sadness can break a person’s spirit. 14 People with understanding want more knowledge,but fools just want more foolishness. 15 Every day is hard for those who suffer,but a happy heart is like a continual feast. 16 It is better to be poor and respect the Lordthan to be wealthy and have much trouble. 17 It is better to eat vegetables with those who love youthan to eat meat with those who hate you. 18 People with quick tempers cause trouble,but those who control their tempers stop a quarrel. 19 A lazy person’s life is like a patch of thorns,but an honest person’s life is like a smooth highway. 20 Wise children make their father happy,but foolish children disrespect their mother. 21 A person without wisdom enjoys being foolish,but someone with understanding does what is right. 22 Plans fail without good advice,but they succeed with the advice of many others. 23 People enjoy giving good advice.Saying the right word at the right time is so pleasing. 24 Wise people’s lives get better and better.They avoid whatever would cause their death. 25 The Lord will tear down the proud person’s house,but he will protect the widow’s property. 26 The Lord hates evil thoughtsbut is pleased with kind words. 27 Greedy people bring trouble to their families,but the person who can’t be paid to do wrong will live. 28 Good people think before they answer,but the wicked simply pour out evil. 29 The Lord does not listen to the wicked,but he hears the prayers of those who do right. 30 Good news makes you feel better.Your happiness will show in your eyes. 31 If you listen to correction to improve your life,you will live among the wise. 32 Those who refuse correction hate themselves,but those who accept correction gain understanding. 33 Respect for the Lord will teach you wisdom.If you want to be honored, you must be humble. Are you dealing with angry people in your life? Are you an angry person? It may help you to know that anger is a secondary emotion. People resort to anger to protect themselves from or hide more vulnerable emotions, like hurt, frustration, humiliation, rejection, fear, disrespect, pressure, etc. Self control is a fruit of the Spirit, a product of walking with Jesus, seeking His understanding before responding. You cannot give someone a fruit of the Spirit, it comes as part of their walk with Jesus; what you can give them is an example as you respond with grace, wisdom and understanding. Which verse of Proverbs 15 stopped you in your tracks today?